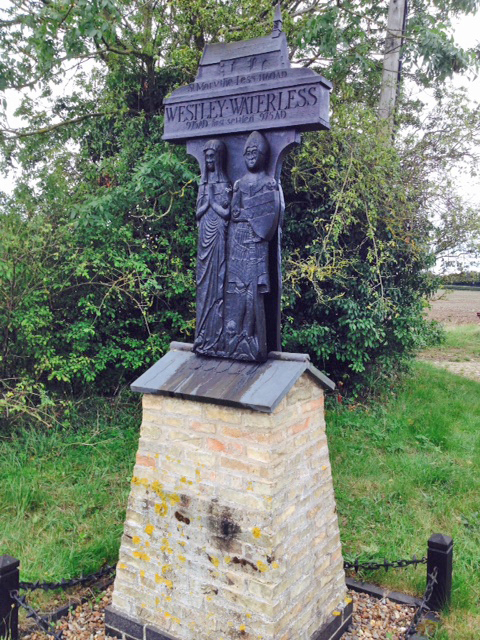 This is a Westley Waterless village sign micro cache by GCZ Team in a series by Smokeypugs (see below). Please replace exactly as found - tweezers may be useful to bring. The series of caches is based on the ornate signs that depict the heritage, history and culture of the villages that put them up (normally on the village green!). A cache hidden very close to the village sign which is a beautifully carved wooden sign depicting a representation of a brass in St Mary-the-Less church nearby. The brass shows Sir John de Creke who died in 1325 and his wife Alyne de Creke. The brass is believed to have been made by Walter le Mason who signed it with his craftsman's mark, and it is actually an original brass rather than made from reused materials. It is the earliest brass in England to show a knight together with his wife. John served as the Sheriff of Cambridgeshire and Huntingdonshire from 1308-1314 and in 1320 he became custodian of the castle at Cambridge. Qhpx lbhe urnq naq ybbx vafvqr. V'z unatvat nebhaq ng fubhyqre urvtug.